Feeling restless, I decided to make a batch of mariquitas. 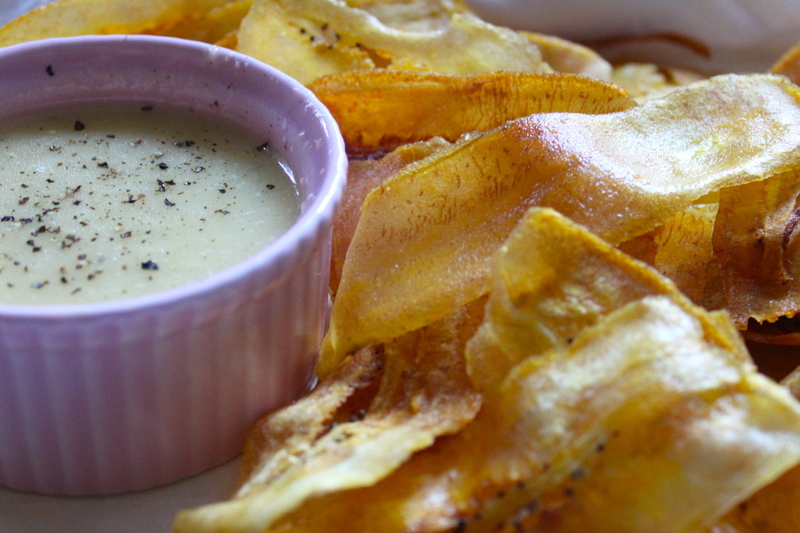 Not the hard, round plantain chips sold in grocery stores, but the ribbon like crisps served with garlic mojo for dipping. Though simple enough to make at home, I could only remember having them in family style Cuban restaurants, where they’d appear ready to eat in baskets. The starter no one remembers ordering but everyone is happy to see. Too rushed to bring out the mandolin, I used my peeler guy vegetable peeler instead to get uniform slices. Plantains were never part of his pitch but it worked perfectly. Paper thin, they crisped up right away without absorbing too much oil. Taking them out when they were still a pale yellow, they went gold in a few seconds. I added more, trying a few (and then a few more) as I worked just to make sure they were right, with each new batch a little less restless. 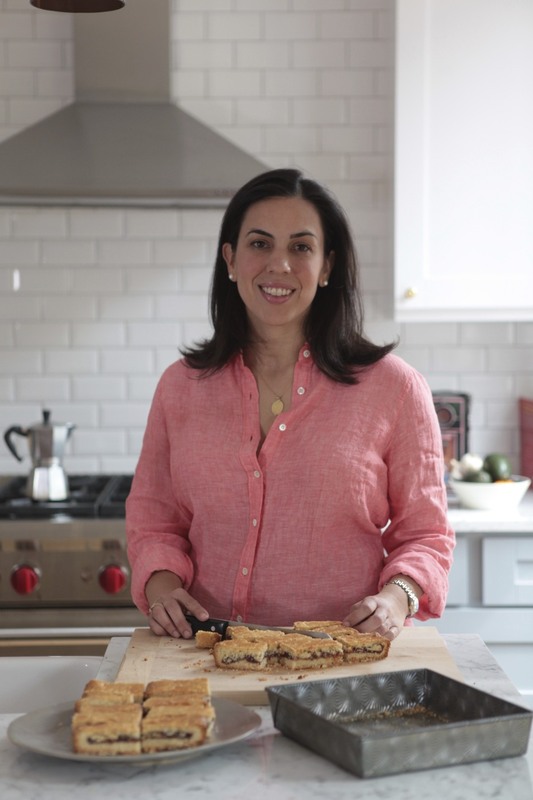 Adapted from Memories of a Cuban Kitchen: More Than 200 Classic Recipes by Mary Urrutia Randelman and Joan Schwartz. While most recipes suggest vegetable or peanut oil which both work well, I prefer grapeseed oil for frying plantains. Cut the plantains in half crosswise. 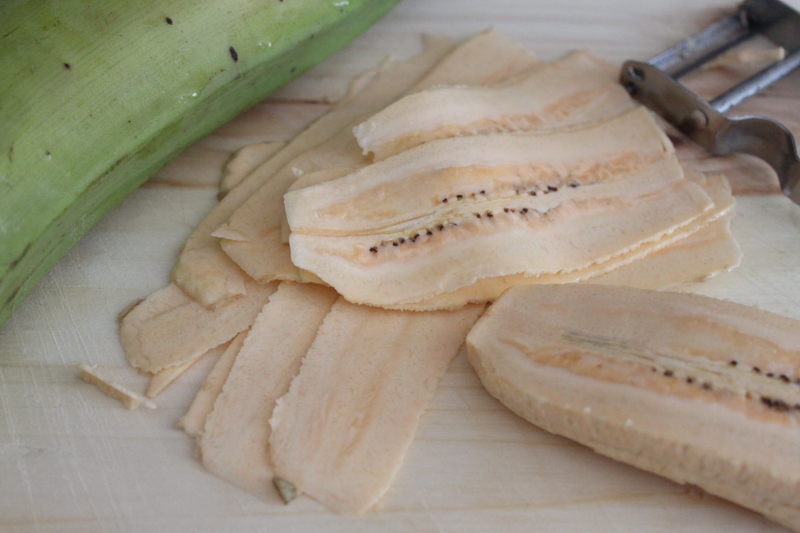 Using a vegetable peeler, pare each plantain half lengthwise in ribbon-like shavings. If not immediately frying, the shavings can be placed in a bowl and covered with cold water to soak for 30 minutes. Drain and pat dry with paper towels before frying. In a heavy skillet or deep fryer, heat 2 inches of oil over medium-high heat to 375º or until plantains slice sizzles when it touches the oil. Add the plantain slices to the oil 5-6 at a time, turning them with a slotted spoon until they are crisp, about 1-2 minutes. Be careful not to overcrowd the skillet or the oil temperature will fall and the plantains will absorb too much oil and become soggy. Remove plantains from oil and drain on paper towels. Sprinkle with salt and serve with vinaigrette. Mash the garlic with one teaspoon of salt to form a smooth paste. Using a food processor, combine the garlic paste, orange juice, and lime juice. With the motor running, slowly add the olive oil in a steady stream until smooth. The ingredients can also be mashed together in a mortar and pestle. These are just perfect for dunking into just about anything. I long for mariquitas with the sometimes warm mojo with lot’s of smashed garlic to pour over the crisp stack of banana ribbons ! I miss having them. Thanks for taking me back to this great app. They look so light and crisp and that’s so key! I think a lot of places, including what you find in bags at an ethnic grocery store is that the pieces, round or sliced, are way too thick. Once you achieve what you’ve achieved in making them delicately thin, you’ve got yourself the perfect recipe. 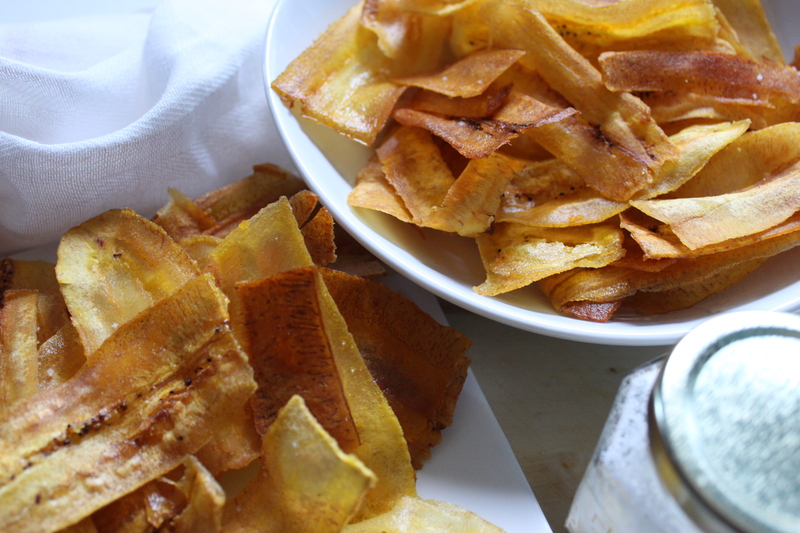 The problem with mariquitas de platano is that you know when you start to eat them, but do not know when to quit. They are addictive and yours look delicious. Most definitely a Cuban comfort food and original. A little F.Y.I., with all due respect to Hungry Sofia, they were found by two Floridian turists on a trip to Cuba in the 50s, specifically Havana. Chicharitas/Mariquitas, Cuban assigned names for the chip, delighted these 2 tourists. A married couple the man a native from Ecuador and the female a multi generational American. The novelty food item was so popular between them they brought back the recipe to Florida where they started the company-Chifles. The first to prepackage the plantain chips. There business grew and they started to disperse their product all over Central, South America and the Carribean. Our Ecaudorian cleaning lady swears they are native to Ecuador but sadly after many argumental encounters I have assured her they belong to the island of Cuba. It’s difficult to let go of comfort food and hurts when others unknowingly or knowingly take it for their own. The few but untouchable and precious memories I have of my grandmother are next to a stovetop in her Miami-dade county kitchen while she excitidely fried plantain chips for her small granddaughter,me, who rose on her tip toes to glimpse at the golden but very hot oil which contained these delicacies ALL for me when grandma would finish. I can still smell them and her with the scent of her Maja soap eminating from her person. A country’s culinary diet can be extremely personal and equally hurtful when others take without knowing the long history of all those grandmothers and mothers who nurtured, created and lovingly served these dishes. To me many of Cuba’s foods are as special as the Madeliene were to Proust when he celebrated it ad infinitum. The mariquita happens to be one. To our Ecuadorian employee they are a cheap bodega fast food sold in the corners of her native Quito city. 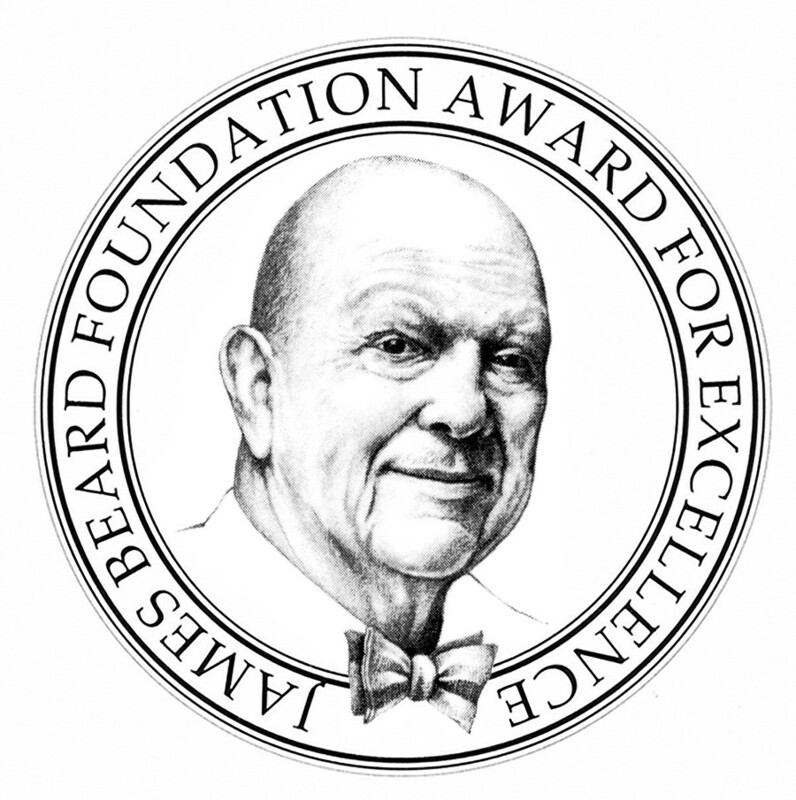 The difference between knowing and calling something your own and knowing where it originated and giving due reference to its culinary creator(s).